The iPad has never been a well-connected device. You get internet connection through Wi-Fi or 3G and you have Bluetooth for a hands-free. That's pretty much everything the iPad and iPad 2 had to offer. Luckily, Apple has upgraded the third-generation iPad with some new goodies. The first and most important one is the LTE connectivity. If you decide to opt-in for the Wi-Fi + 4G model of the new iPad, you will get a tablet that supports almost every mobile connection out there - all popular GSM, UMTS, CDMA, EV-DO, LTE bands. To use LTE or CDMA, you'd need a contract with a carrier and in some cases you'd have to buy the device only from the supported network providers. On a positive note, Apple has finally brought the personal hotspot (available only when the carrier of choice supports it) on the iPad. This is the only iPad where you can tether your data connection through Wi-Fi, Bluetooth or via USB cable. It works just like on the iPhone, so no iOS user should have problems configuring it. The Bluetooth is now 4.0 version, but whatever version Apple put in an iOS gadget, it's most used functionality will remain the Bluetooth hands-free/headphones support. File transfers are not supported as usual. The Wi-Fi connectivity is the same as before with a,b,g and n support. We found no problem with the Wi-Fi connections and the signal strength is pretty much the same as on the iPad 2 despite some incidental user reports. The proprietary connectivity port is the last connectivity option on the list. You can use it for USB connection with a computer or you can attach an SD reader, USB or HDMI adapter on it. The SD reader and HDMI adapter are pretty much self-explanatory, while the USB one gives you a standard female USB port. There you can attach other devices supporting mass storage mode - cameras, iPhones, other tablets, etc. and download pictures and videos from them to the iPad. There is one odd thing while charging the iPad - it won't charge while you are using it. In most of the cases, the battery level won't drop either - it seems the iPad is eating up all the charge coming from the wall charger and nothing is going into the battery. But if you start playing, let's say Infinity Blade 2, the iPad will start draining the battery too. So, you shouldn't use the iPad while charging. Sounds like a bummer, right? It's almost hard to believe but we confirmed it in several tests. There is one more thing - the iPad doesn't show it is charging when connected to a computer, but in fact it is charging. Though the charge is so insignificant, that it is probably the right thing to say that USB charging is not really supported. Web browsing has always been a key point in the iPad's repertoire. It's fast and fluid and now, with the enhanced resolution, fans will get a real kick out of browsing on the touch-enabled 9.7" screen. Loading speeds exceed those on the previous iPad and many times those of the iPhone 4S, there's fluid touch control and gesture support (pinch zooming also works like a charm). The multiple tabs support and the auto fill and password managers also improve the usability of the Safari browser greatly. The pop-up menus appear as small windows on the screen itself rather than occupying the display things are even more desktop-like. The Reader mode is a great way of reading articles in Safari. It strips the web content of fancy fonts and ads and presents you the bare minimum that's really easy on the eye. It works alright on most pages but you won't find it available as an option on all pages. For those cases Still there are always other options - like Evernote Clearly and the likes. We've heard complaints about the Wi-Fi antenna on the iPad but we found ours to be on par with the previous version and the one on the iPhone 4S. We didn't experience any problems with it at all. We would prefer the Wi-Fi+3G/4G (LTE) version of the iPad as it would prove a lot more versatile than the Wi-Fi only. The 3G/4G variant not only has a true GPS receiver but the active data connection allows for Assisted-GPS functionality and cellular base station triangulation for instantaneous location services. 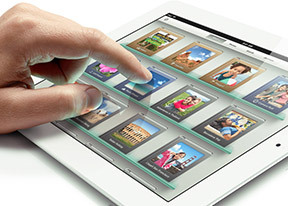 Multi-touch gestures are present on the new iPad just as they were on the iPad 2. You can switch between the active apps using four (or five)-finger swipes. A similar swipe to the top will bring you the task switcher. The last gesture is four (or five as it feels more natural) finger pinch zoom out. It will bring you the homescreen, while the app will go in background. The pinch zoon out and left/right swipes works everywhere but on the homescreen, while the swipe up gesture is available everywhere. We have to admit those gestures are quite useful. Here's a video demo of the gestures in action as shot on the iPad 2.